The beautiful Blue-headed Parrot is easy to identify as an adult, when they have their fully developed their striking plumage! One of the most well known and popular of the Pionus parrots, the Blue-headed Pionus are active, intelligent and inquisitive. Though they are not known to be the best talkers, they make up for this with their friendly disposition and fun antics. The Blue-headed Pionus is noted for its gentle nature and can become a very devoted pet, sometimes bonding fiercely to their owner. They are considered an excellent bird for a beginning parrot owner, and because they are generally calm and quiet, they are also a great pet for people who live in apartments or in close proximity to neighbors where noise can be a problem. Distribution: These birds are native to southern Costa Rica in Central America, through South America to northern Bolivia and central Brazil, and on Trinidad. They inhabit both light and heavily timbered forests in rainforests and tropical zones. Description: The blue-headed Pionus is a small to medium size parrot with a wonderful personality. They have a uniform green plumage with a bright blue head, black feathers over the ears, and throat feathers with varying amounts of pink. Like many of the Pionus, the Blue-headed Pionus does not get it full coloring until it is mature, but when it does its beautiful feathers have an almost iridescent quality. There is quite a variation in coloring from bird to bird, with some having a darker shade of blue on the head and more or less of the pinkish coloring on the throat. They have the bright red undertail feathers distinguishable to all the pionus. The beak is a dark grey color getting red close to the head, the eye is dark brown with a light grey eye ring, and they have pale greenish-grey legs. Juveniles have paler coloring and less blue on their heads than the adults. Size - Weight: These birds are a medium sized Pionus and grow to a length of 11" (28 cm). Social Behaviors: In the wild they are generally seen as just a few birds up to small flocks of about 15 birds. They are seen singularly or in pairs during breeding season. These birds tame very easily and are very sociable. They are not loud like many conures and amazons. Breeding/Reproduction: There is no visible means of sexing these birds. In the wild they nest in hollow limbs or holes in trees. They are moderately difficult to breed in captivity. Place a nest box high up in a dark area of the aviary. The hen lays 3 to 4 eggs, which are incubated for approximately 24 to 26 days. The young leave the nest at approximately 8 to 10 weeks of age. The young are difficult to hand rear from an egg, and they do best if the parents feed them for the first week. Pairs may take mealworms and greenstuffs when they have chicks in the nest. ..."Fabio is a very nice Blue-headed Pionus that apparently "doesn't have a mean bone in his body"!" "Hey Hobie, see that second limb on the right?" See " Pionus Pete's" picture below. He's an older wild caught Blue-headed Pionus. Potential Problems: The Blue-headed Pionus is a relatively healthy bird, though the Pionus parrots have been known to be more susceptible to the infection aspergillosis than other species. The main symptom is heavy, belabored breathing. The other two most frequently available pionus are the Maximilian's Pionus, and White-crowned Pionus. "Pionus Pete" is a wild caught Blue-headed Pionus that is at least 18 years old. Pete originally came from Costa Rica. Pete is a beautiful bird with a deep blue head and green body. He has a wonderful home which he shares with an african grey, a cockatoo, several macaws, and a cockatiel. Please Note: The importation of wild caught birds is now illegal in many countries and strictly controlled in many others. We don't recommend 'wild caught' birds. In most cases it is a bad idea to purchase a wild caught bird. They are usually not as healthy, they have often not been handled properly, and they will often not make as good a pet as a captive bred bird. Today the practice of taking birds from the wild is unnecessary due to the increase of captive breeding. I got my blue headed pionus about 2 years ago. He means the world to me and he is very quiet and very sweet. I got him because I rememberd the info I got off this wed site. So thank you Dr. Jungle, and I hope every one loves there pionus as much as I love mine. 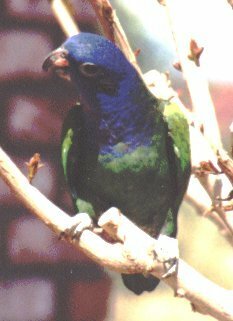 My step-grandparents had a blue-headed pionus, which I nicknamed 'Bluey'. S/he was wild caught. S/he had a wild temper and bit me! It hurt but now I laugh whenever I think about being bitten by him/her. I fell in love with Archie, my bluehead pionus as soon as I saw his eyes. I was also encouraged by all the great comments on how sweet pionus are on the internet, and so home he came with me.